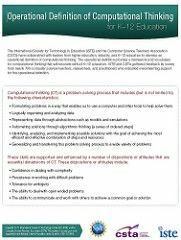 Download the Operational Definition of Computational Thinking for K-12 Education. Produced by the Computer Science Teachers Association (CSTA) and the International Society for Technology in Education (ISTE), this is a very practical guide, as its title suggests. Oh well, onward and, hopefully, upward!